When you ask women about the one essential makeup product that they can’t live without, most people would say kajal. I must agree! A swipe of kajal on your eyes and it completely wakes you up. There’s a reason why even our mommies were obsessed with it. It enhances your eyes and makes you appear energetic and bright. 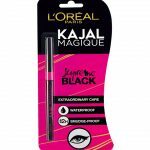 Since we are always on the lookout for “the perfect kajal”, here we present the review of L’Oreal Paris Kajal Magique. So, read on to find out if it’s worth the critical acclaim! The product comes sealed in a pink and black package, which is plastic on the front and paper at the back, which makes it quite easy to open. The pink and black theme is followed by the actual product as well. Once you open the cap on top, you will find that it is retractable. All you have to do is twist the product from the bottom. Vitamin E—Some studies show that Vitamin E may help in preventing cataracts. Cocoa Butter—Cocoa butter keeps the area around your eyes well moisturized. The mineral pigments in this product give it that intense black color. Comes in a retractable twistup style packaging. 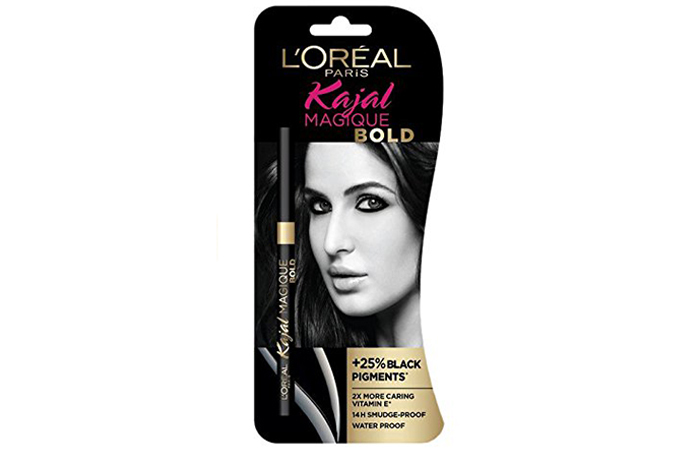 Pigmentation: Thanks to a new generation formula, the pigmentation of the Loreal Paris Kajal Magique is incredibly black. The product contains mineral pigments which are responsible for that deep, intense black color. Texture: It’s extremely smooth, so it goes on very well. It’s not a matte product but the texture allows the deep black to stand out against your skin. 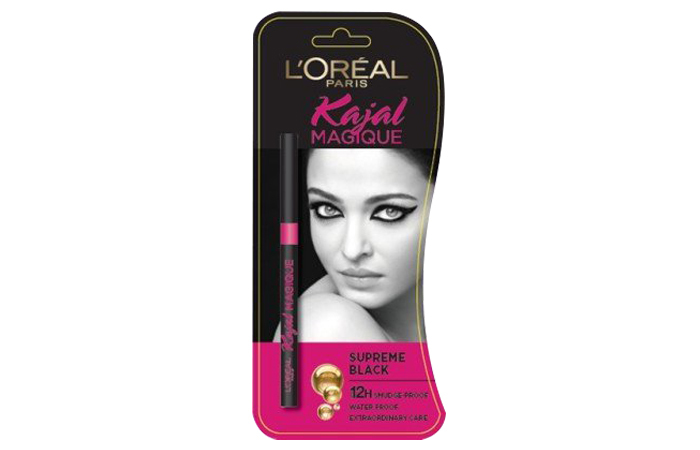 Contact lens friendly—The Loreal Paris Kajal Magique can be used by contact lens wearers without any worry. Ophthalmologist tested—For those of you that may worry if this kajal is safe enough for your eyes, rest assured, it’s completely safe! Intense black finish—Just watch yourself after the finishing touches. Smudge proof for 5-6 hours—Worried about the Kajal spreading all over your eyes and looking like a raccoon? Well, your worry is over as the L’Oréal Paris Kajal Magique does well to stay in its place without smudging. Fades away in a few hours—If you’re someone who has oily skin, then you probably understand the struggle of finding a Kajal that stays in place. This one leaves the water line in a few hours but doesn’t smudge too much. After using it on a regular basis, I found that it does not live up to the 12-hour staying power claim. However, it does stay put without smudging for 5-6 hours which is pretty decent considering the price of the product. It takes a few swipes to achieve that intense black shade, but it is there nonetheless. The packaging of the product makes it easy to carry around everywhere, and the retractable style of it prevents any wastage of the product which is a huge plus over the kajals that you would have to sharpen to use. That’s another thing worth mentioning. The size of the product is just perfect. It’s not too thick, and in case one is looking for a thicker eyeliner look, it can always be built up. 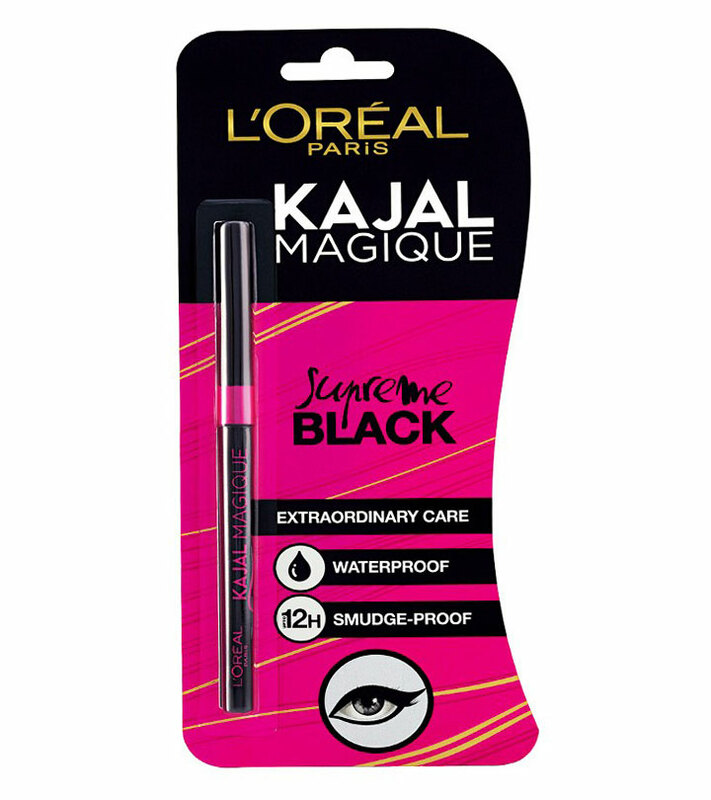 How To Use/Apply L’Oreal Paris Kajal Magique? The best part of this product is that it can be used in multiple ways. It can be used on the waterline, lashline and your eyelids. Its intense payoff makes it perfect for a smoky eye as well! Step 1: Peel off the paper packaging from the back. Step 2: Remove the cap at the top and check to see if there’s enough product to apply. Step 3: Twist the product from the bottom in case you need more. Step 4: Swipe it onto your lash line. Add another coat if required. There are unlimited ways to use this kajal, but these are probably the most popular. This is for those of you who just go for that traditional kajal look passed down to us from over the generations. Step 1: Start with clean eyes. Twist the product till you have something you can work with. Step 2: Swipe it along your bottom waterline twice. Step 3: Now for a bit of an intense look, go beyond the waterline and apply it on the lashline as well. This will definitely make your eyes look brighter. Okay, so one swipe of kajal at the bottom of your eyes isn’t enough? We’ve got you covered. Step 1: Apply the product on the lower lashline and waterline as mentioned in the previous tutorial. Step 2: Now to take it up a notch, apply the Loreal Paris Kajal Magique close to your upper lashline as well. This gives your eyes an intense look. The name smokey says it all! Step 1: Apply the product to the lower waterline and lashline. Step 2: Now, smudge out the lashline to make it look smokey. Step 3: Apply the product all over the eyelid and smudge it out with either a brush or your fingers. How To Remove L’Oreal Paris Kajal Magique? This kajal can be easily removed with a makeup remover or some coconut oil. Step 1: You can use a cotton pad for all over the eye and a cotton swab for the lashline. Step 2: Dab some makeup remover or coconut on it and rub it softly over the eyes till the product comes off. Step 3: Go in with the cotton swab for a more detailed and precise removal. Step 4: Cleanse your face with a wash and make sure to follow up with your skincare routine. It claims to stay for 12 hours, however that is not the case. It stays for about 7 hours. Apart from the original black shade, there is one more shade called ‘bold’. This one is darker than the original color, for those who love that ultimate, black kajal. Packaging—This product comes in a black and gold packaging on both the outside and the product itself. Staying Power—They claim that the staying power is 8-9 hours. Pigmentation—It’s quite rich and jet black and is a great option to achieve that deep black intense look. Texture—The texture of the Loreal Paris Kajal Magique in the shade Bold is a winner for most people due to its creamy consistency. It glides on extremely smoothly! However, you must be careful during the summers to not exert too much pressure. Formula—It’s not a matte finish, but the satin finish is something that is definitely desirable. Will I Repurchase, And Do I Recommend It? Yes definitely! The quality of the product and the quantity for the price offered is actually pretty impressive. It gives a strong competition to the other kajals that are currently doing well in the market. Overall, this was an excellent product. It’s easy on the pocket as well and the product does a superb job. I would definitely repurchase this product, and I know I would get good use out of it. 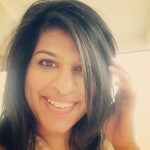 It has become my go-to kajal! I highly recommend that you give it a shot as well! DIY – How To Prepare Kajal At Home? How To Apply Kajal Perfectly?